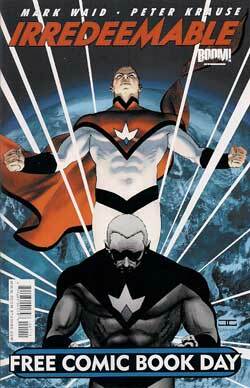 This week, I'm reading and reviewing FREE COMIC BOOK DAY comic books. I got 35 issues at York Comics and Games, 11 of which I've already reviewed over the past two columns. Asylum Press' Fearless Dawn/Asylum Press Sampler #1 is a moderately interesting mixed bag. It starts with an eight-page preview of Steve Mannion's "Fearless Dawn" which, though confusing in its introduction of its off-kilter heroine, is presented in such a lively manner that I'd be interested in seeing more. The other previews are less enticing. The four-page chunks of "Warlash" and "Warlash Origins" feature so-so writing and muddy artwork. Neither convince me to follow them in their own titles. "Black Powder," which seems to be about Ohio River pirates in 1811, has an intriguing premise, but the story and art seen here aren't equal to that premise. The same can be said of the eight pages of "Farmhouse," a 160-page graphic novel about a mental institution. The Henad Gucunja art for "Undead Evil" is kind of sort of spiffy, but there's nothing in them to explain the premise of this series or demand my further attention. Finally, there's the preview of "Eeek!," a 176-page anthology of "retro-horror bound to give you the creepies!" This consists of the first two pages of three stories by writer/artist Jason Paulos. I like the style of the art and writing, but would have preferred to have gotten one complete story, the better to judge if I would enjoy the collection. This FCBD issue gives me a decent idea what to expect from the publisher, but the only featured titles I might try in the future would be "Fearless Dawn" and "Eeek!" Fractured Fables [Image] features five tales from the forthcoming 160-page hardcover of the same name. 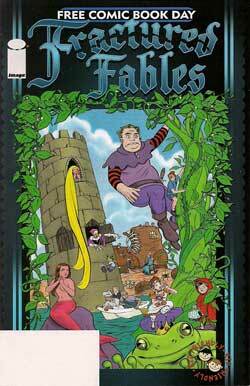 I enjoyed these tales, especially Bryan Talbot's take on "Little Red Riding Hood," illustrated by Camilla d'Errico. But all the stories were terrific fun. Between the self-explanatory title and the choice examples, this was a first-rate FCBD comic. I'm eager to read the complete anthology, which is scheduled to hit the stores in July and which will also feature contributions by Peter David, Phil Hester, Neil Kleid, Terry Moore, Bill Morrison, Whilce Portacio, Jill Thompson, Jim Valentino, and others. IDW's G.I. 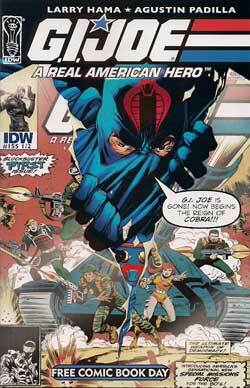 Joe: A Real American Hero #155-1/2 is one of my favorite FCBD issues. Writer Larry Hama returns to his original Marvel Comics run on a series that even continues the numbering of that series. Even without any appearances by the G.I. Joe heroes themselves, this story grabbed me from the start. Hama skillfully introduces his characters and concepts so that even a new reader is in the loop. He sows sub-plots throughout the tale and leaves me wanting more. Heck, I even want to go back and read the previous 155 issues of the title. With solid visuals from Agustin Padilla, this is one of 2010's most successful FCBD efforts. I was looking forward to Dynamite's FCBD edition of Green Hornet because I always thought the character was cool and then some. I particularly liked Ron Fortier's scripts for the 1980s Now Comics series, and I really wanted to see Eddie Murphy take on the role back when that was the hot Hollywood buzz. Grafting a little bit of Axel Foley onto the Hornet could have been fun. But, as I often do, I digress. I report with considerable dismay that I was very disappointed in this FCBD comic with its previews of five different Green Hornet titles. The issue was not at all friendly to new readers and there wasn't enough meat to any of the brief previews to hook me on any of the titles, even though some were nicely drawn and seemed to be well-written. 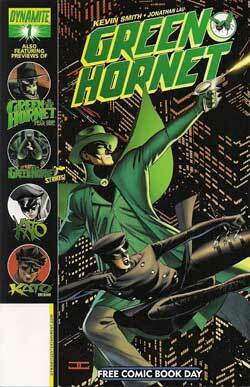 It was Green Hornet overkill. As a Hornet fan, I'll doubtless read some of these series as they find their way into my hands. But, if I were new to the hero, I would give them a pass. 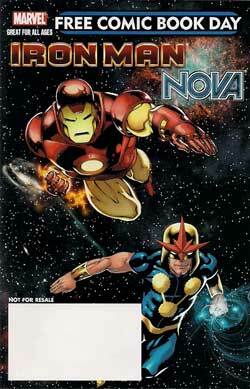 Free Comic Book Day 2010 (Iron Man; Nova) is the first of the Marvel Comics issues for the event. The done-in-one teaming of the two heroes against the Red Ghost and his super-apes is an entertaining tale from the all-ages "Marvel Adventures" imprint. It has a solid script by Paul Tobin and equally solid visuals from artist Craig Rousseau, but it lacks the sense of actual menace that would have made it truly exciting. The issue also features a four-page "Super Hero Squad" story by writer Todd Dezago and artist Leonel Castellani. I have not yet warmed up to this concept: super-deformed and apparently pre-teen versions of Marvel heroes and villains. Your mileage might vary, which wouldn't surprise me. I know "The Super-Hero Squad Show" is a popular program on the Cartoon Network. I have two quibbles about this FCBD issue. There should have been something in the issue explaining the concept behind "Marvel Adventures" for new readers...and there should have been a bit more background on Iron Man and Nova included within their story. But, overall, not a bad FCBD book. I'm not sure where it falls in current Marvel continuity or, for that matter, even if it does fall within current continuity, but I am sure that I enjoyed the heck out of Free Comic Book Day 2010 (Iron Man/Thor). It contains a done-in-one and very smart Iron Man/Thor team-up by Matt Fraction with art by John Romita, Jr. and Klaus Janson. That the threat these heroes face is the result of an unregulated use of technology hits home as the BP oil spill pours into its second month. While there isn't much information on the heroes for new readers, Iron Man is already well known to the general public from the movies and Thor doesn't require that much explanation for this story. 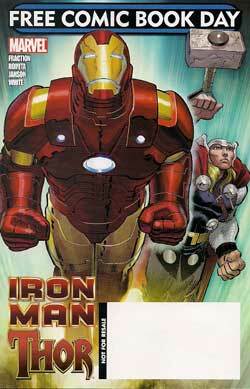 If this was my first exposure to Iron Man and Thor comics, I'd want more of the same. From Boom Studios, we got a Irredeemable/Incorruptible flip book for Free Comic Book Day with the complete first issues of these connected series. In the former, the Plutonian, the world's greatest and most powerful super-hero, becomes a mass-murderer on a scale of millions. In the latter, Max Damage, one of the world's greatest super-villains, sees the death and destruction perpetrated by his enemy, and decides someone has to step up and figure how to save them all. Creator/writer Mark Waid is doing some of the best work of his star-studded career and some of the best modern super-hero writing anywhere. He really brings across the terror of this Plutonian-ravaged world, the personal struggle of Max Damage to be a true hero, and the confusion experienced by Max's former allies and enemies. To this terrific writing, add amazing art by Peter Krause (Irredeemable) and Jean Diaz (Incorruptible) and you have a pair of must-read super-hero comics. I can't imagine a new reader sampling these series and not wanting to buy them. Ape Entertainment's Kizoic Presents flipbook had Shrek on one side and the Penguins of Madagascar on the other. On each inside front cover, there's a paragraph introducing the characters and that's always a good thing. There are two Shrek stories. 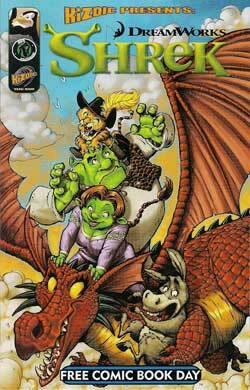 The first is so-so, but Russell Lissau's "The Parent Trap," in which Shrek's parents come calling, is an amusing little gem with nice art by Christine Larsen. 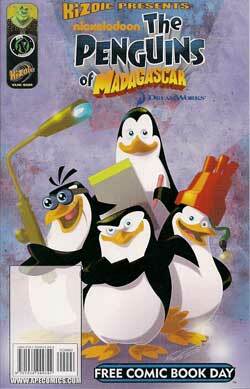 On the flip side, neither of the two Penguins tales did much for me. Your mileage might vary. This issue was a decent introduction to the cover characters. Some other Kizoic features are shown on a center spread. Though a few looked interesting, there wasn't any information on them beyond the images. A few lines of description on each would have been a useful addition. That's it for today. Thanks for spending part of it with me. 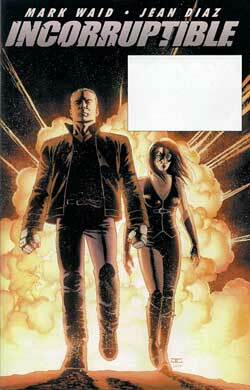 I'll return on the morrow with another batch of Free Comic Book Day reviews. See you then.